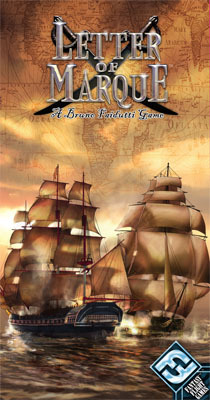 Letter of Marque is a swift-moving game of treasure, temptation, and trickery on the high seas. Players sail their gold-laden galleons across the ocean while sending out raiders and avoiding the cannon fire of fellow privateers. With only two defended ships and five piles of treasure, each player must bluff their way to port to bank their hard-earned riches, while also venturing to make off with as much of their enemyâ€™s gold as possible. Letter of Marque is a card game for 3-6 players, ages 13 and up, and is playable in 30 to 45 minutes.